Israels Walla! news (http://bit.ly/1xUZd5a ) was first to report on this. The shonda is that the rasha Abbas was left in. Why didn't they also remove the image of Abbas. That doesn't bother them? Please do not inflame sensitivities via misinterpreting stated positions. No one says that the female body is "immodest", nor that the female leaders edited out of the picture were in any way "immodestly" dressed.The paper is rather being wholly consistent with its stated editorial policy, not unlike any other publication that has its own proclivities. It is published for an audience that expects such fealty to its halachic standards - it is their right to exercise that choice. Did Walla report about the reportage in Riyahd or Teheran? That's just so....religious[ly stupid]...I could just plotz I'm so proud to be a Yid and have HaMvaser represent me before the world. Oy! "fealty to its halachic standards" Which Halachic standards are those? Could you site a Teshuva from anyone that advocates for such a thing? Anyway, if the picture was a problem - don't publish it, no one would care. Or is Chillul Hashem not part of their "Halachic standards"? Just for the record - that wasn't the PM of Denmark, it was the Mayor of Paris. If they would have left in the figures and just blotted out the face, I would have said that they are consistent with their "belief". But to remove the bodies and close up the ranks to make it look like they weren't even there to begin with, is just insane. How about just not including any pictures at all, unless this was done just in order to get attention? "That rasha Abbas was left in" You dont get it, Bibi went there only because the election. By removing the woman he gets the frumme vote. Abbas is not a proble. Maybe even a plus. They are entitled to their own opinion, not their own facts. "Why didnt they remove the image of Abas" Just the opposite, Bibi is trying to get votes showing that he is open for negotiatins. “ Just for the record - that wasn't the PM of Denmark, it was the Mayor of Paris. I'm really sorry but you do sound pretty stupid. So please explain yourself why in the world is there any different if that take them out completely. All thay would gain by putting it in covering the face would be that even the other people with bal batishe hashkofes who didn't chap now will also get all upset. Nebech, how these people pervert Yiddishkeit! Every publication needs to cater to the sensitivities of it's readership. If a Newspaper has a standard policy of not printing pictures of females, then so be it. It shouldn't bother anybody (except people that get annoyed because somebody dared to present themselves as more Frum). True, it may be a radical Chumrah, but who cares?! It's not personal. I, for one, find it refreshing that there are still some old-fashioned prudes ("Chnyuks") in this world. I do however agree that it would have been more sensible to just blur the images of the females. Yes we did. Take it in your tick head. We don't publish pic of women. Not printing the picture would have been a valid exercise of editorial discretion. Altering it without acknowledging that it has been doctored is journalistic terrorism. the chumrah of the week never ceases to amaze me - would the newspaper show the pictures killed by the terrorist. Why show pictures at all - the irony is those people killed in Le suis charlie were protecting the rights of this newspaper - and the irony is they do not have the 'class' to give them respect. 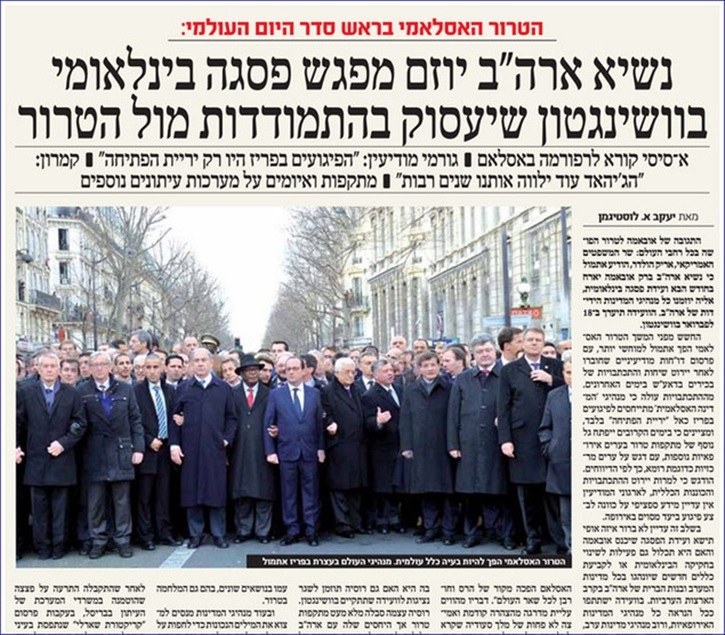 I dare anyone to tell me that there is a halacha against having shown the picture including the female leaders. Nevertheless they have the right to do what they want to do and I have a right to look it at this paper and see a big chillul hashem to the world! There is no problem to publish photos of only men, if that is your policy. But to remove the women who are in the photo is dishonest. It is a lie. That is a problem. When Hamodia took out the photo of Hillary Clinton when they were in the situation room during the capture of Osama Bin Laden, it was awful. If your policy is no women, fine. But you cannot doctor the photo to remove them. Publish a different photo or leave the photo out. To blot the women out is a lot of nerve. If they didn't publish the picture, it would have been less of a problem than removing a woman who is in it. Yes, they did remove the women, even though there was nothing immodest about the picture, because they don't there can't be any suggestion of a woman having a role in public life. It's about control over them, not modesty. This article already has 25 posts, yet hardly any of you think to post condolences formthe Paris vidtims and their families. Shame on you!!! As usual, men who don't know how to learn envy and resent those who do. As simple as that. Who says Muslims have a monopoly on extremism. This show we Jews have our own. “ "fealty to its halachic standards" Which Halachic standards are those? Could you site a Teshuva from anyone that advocates for such a thing? It is not a question of your standards or mine - in a free society every one can choose the chumras they choose, as long as they are not imposed on others. just as you have the right to view any publication you wish, do not deny that right to others. The purpose of this entire article is to foster ill-will, not inform. This article delivers no relevant news, for this policy of certain papers is established practice for many. The sheer volume of responses gives testimony to the intent of the writer. - to inflame, not inform. Wow, a mind reader! 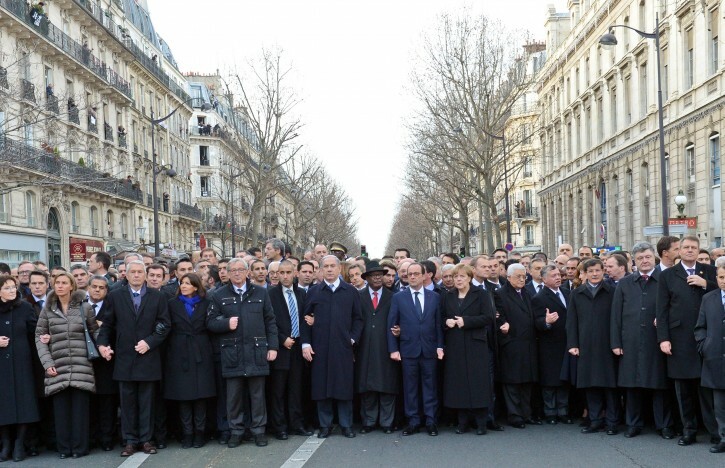 You know for certain why the Israeli prime minister went to the Paris demonstration. When he was injured while freeing hostages during the Sabena plane hijacking, I bet his aim was to get votes. Same thing when he wrote a book on international terrorism. His brother, Yonatan zl HyD-- was he killed trying to free Jewish hostages taken from a French plane? I think they removed Obama from the picture also as I don't see him either. As the Daily News so eloquently put it "Obama you let us down"
The Hamevasers policy is quite understandable, however what's quite difficult to understand is which male on their staff does the actual editing out of the women, assuming that the Hamevaser can't have any female employees?! Unless they have some way of editing it out without their male employee editor actually seeing the original photo which can be quite a feat! Till he edits it out the Hamevaser with all due respect is subjecting him to what they don't want to subject their general readers to which is a double standard! Boycott all frum magazines that will not print picture of women. Don't be a self hating woman. BTW, does anyone read it any more? Perhaps all of Hamevasers staff are all female including all the censors and editors which can help explain why are permitted to block out female photos! Unless Hamevaser has a better explanation it would otherwise seem somewhat hypocritical as comment #32 alludes to. Big deal! People who read this fish wrap know there are women leaders. They also know the paper won't print pictures of women. Fanatics! How are these uber-religious freaks any better than those of ISIS when everything they do or touch denigrates women? Move back to the 16th century if you want to live your life that way. So sickening. I don't have a real problem with the paper's policy. If their policy is to not show pictures of women, then so be it -- I can either accept it or vote with my dollars (shekels) and not buy it. What troubles me far more is the fact that they published an altered version of the picture. This speaks to their journalistic ethics. If they're going to edit a photo, then I'm sure they would have no compunctions about editing other things as well. In other words, I don't think I can believe anything that they print, since they've so blatantly advertised the fact that they're willing to edit the news to fit their theological worldview. A perfectly acceptable alternative - which would have allowed them to stay true to their policy AND maintain their journalistic ethics, would have been to simply not publish a picture at all. It's a real shame that they decided not to do that. Quite possibly but probably not, according to those who know the paper. In any case it was a good shot and good thinking as I thought the same. #34 Boycott? The readership of these kind of newspapers want it that way including me. I actually have spoken to many women who enjoy frum magazines but are frustrated that they never see pictures of the interesting women interviewed. I say no more. Ladies, boycott these magazines until we can have at least one magazine that doesn't treat us as pritzus.